Anticipating the rout of the Republicans in the 2006 Congressional election, the Republican Jewish Coalition (RJC) used their own flawed polling data instead of the National Election Pool’s exit poll data in order to reassure their donors that the money spent on the until then unprecedented ad campaign had not been spent in vain. During this election season the RJC took their ad campaign to an even higher level, spending over two million dollars not only in full-page ads, but even on the television. With the landslide victory of Barack Obama --- despite his middle name and the many advertisements focusing the attention of the Jewish community on it --- the Republican Jewish Coalition held a press conference shortly after the election to take stock of the results. In his press release originally entitled “Republicans Continue to Maintain Inroads in the Jewish Vote Despite Obama Gains in the Rest Electorate” Matt Brooks showed nothing of the kind. The bottom line is Obama carried 78% of the Jewish vote this year, a clear progression over Kerry, who had the support of 74% of the Jewish community in 2004. The RJC scrutinized this year’s results not in comparison with the 2006 “poll” which they commissioned from Republican operative Arthur J. Finkelstein, but with the very National Election Pool’s exit poll data which they spurned at that time. Matt Brooks took solace in the fact that Obama’s gains were not as great as they were in three other demographic groups: Latinos, Catholics and African-Americans. Matt Brooks claimed Obama’s inability to match the gains made within those three groups was a great victory on the part of the RJC over the NJDC. Obviously, the Jewish vote was already very high in 2004 compared to Catholics and even Latinos so there is a limit as to how much further Jewish support for the Democratic Party could increase. Keep in mind that while African-Americans may have had an initial bias towards voting for Obama due to their common heritage, the Jewish community clearly had an initial bias against voting for someone of a different race with a Muslim father. As the general election campaign began, Obama had the support of only 57% of the Jewish community. However, as the campaign wore on, the Jewish community took a better look at Senator Obama. The Obama they saw during the debates did not fit the narratives they were being told, and as a result the Jewish community by and large repudiated the heated, nasty rhetoric from the RJC. 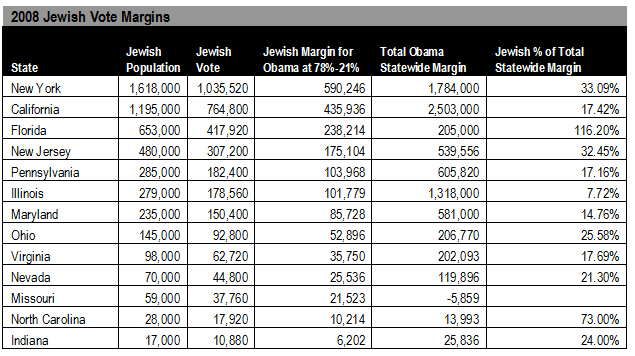 While the national exit poll did not break down the Jewish vote by state, if we assume the Jewish vote was equally distributed, Obama’s advantage within the Jewish community in many states was a significant proportion of his overall margin of victory. The Question and Answer period which followed the press conference was lively as journalist after journalist questioned Matt Brooks’ assertions. Eric Fingerhut questioned why during the course of the RJC anti-Obama ad campaign Obama steadily increased his support from 57% in September to 78% in November. Matt Brooks claimed they knew all long Obama’s support would increase and took pride in holding him to 78%. However, when the first poll came out on September 25, Brooks in an interview with the Jewish Telegraphic Agency predicted even “bigger gains come Election Day. Shmuel Rosner from Ha’aretz asked if Obama succeeded in convincing Jews that he really is a friend of Israel. Matt Brooks replied that if Obama did succeed in doing so, the RJC could take credit for doing so. In fact, Obama was taking strong pro-Israel positions even among the gentile electorate in Iowa long before he gained the front-runner status and became the lightning rod for RJC attacks. Finally, Eric Fingerhut brought the irony of Matt Brooks changing his tone so soon after the election. Prior to the election, the RJC characterized Obama as “dangerously naïve” but now Matt Brooks claims the RJC wants to work with Obama. Eric also took objection to the RJC’s claim that they were “outgunned” by the Democrats when the RJC spent many times more than the NJDC, the Great Schlep, and Jews for Obama combined. Indeed, the Obama campaign did fight a great ground game, bringing over one hundred Jewish surrogates to over a dozen states and key congressional districts. At that point in the phone press conference, Matt Brooks claimed that none of the callers had any additional questions and signed off. While the Philadelphia Jewish Voice appreciated the opportunity to participate in this press conference, it did signal immediately at the beginning of Q&A that we would like to ask a question, and we signaled again when they called for more questions. After the press conference, we sent the RJC the following email in hopes that some technical glitch prevented our question from being noticed. I was surprised at the end of the conference call when you called for more questions and then terminated the call because there were none. I had signaled on my numeric keypad that I had questions from the beginning of the Q&A. Assuming this is a technical glitch of some sort, I hope you look into it and get it resolved. Here is the question I had prepared, and a number of other thoughts that flowed out of other people's remarks. I would be grateful if you could respond to them in writing, or agree to be interviewed for a future column in the Philadelphia Jewish Voice. Your advertising argued that in comparison with McCain, Obama surrounds himself with anti-Semites, does not understand the Iranian menace, and would make undue concessions to the Iranians at the expense of Israel. Is this consistent with (a) the repeated opposition (as recently as last month) of McCain & other Republicans to legislation that would stop US companies like Halliburton from doing business developing the Iranian petroleum industry, and (b) Obama's reported selection today of Rahm Emmanuel as his chief of staff? The NJDC labeled your advertising as unfair and discouraged surrogates from participating in RJC organized events. How do you respond to those charges and to the NJDC's response? Do you expect to resume coordinating events with the NJDC in the future? Since Obama beat McCain by 7% in the popular vote while Kerry lost to Bush by 1% in the popular vote, are you not making a mountain out of a mole hill by touting that the Jewish vote "only" increased by by 4%? 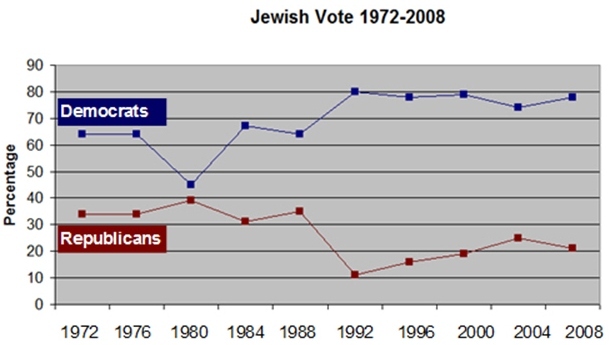 Indeed one could argue that there is not much room left for growth in the Jewish vote. Despite several follow-up emails and phone calls, we have yet to receive any response to our questions. Political action groups often engage in “spin”, but Matt Brooks has taken spin to a new level.